Method, Etudes and Exercises, General Instructional, Technique Training. 61 pages. Published by Tiger Music (S0.208309). Many trumpet players struggle with chop problems. It’sdemoralizing when you know you are a great trumpet player, but your limitationsin endurance and range exclude you from crucial opportunities. The question is,how do you develop range and endurance without putting all your eggs in thehigh note basket? Most great trumpet players with limited chops deplore theidea of practicing high note methods! They want to be able to grow their rangeand endurance in a way that will not sacrifice their current strengths. Evenbetter, what about a practice routine that will give them a better range butalso improve their other strengths as well? There are dozens of practice routines available to themodern trumpet player with new ones being added at a dizzying rate. Some of usalready know what works for our specific needs while others seem to be swimmingaimlessly through a sea of exercises and confusing information. Amid so many options, the Trumpet Chops seriesstands out as being not only physically but also musically beneficial. Yes, Trumpet Chops Pro will help you with your range andendurance. But Trumpet Chops Pro is so much more than a strength, range orendurance builder. We believe that all physical work should be done for musicalreasons. This routine is designed to help you become a better musician, not ascreamer. All the exercises work toward a musical objective, not by pushing youbeyond your limitations (as some think you should), but by enhancing andexpanding your abilities from within their musical foundations. The concept isto grow your musicianship to meet your physical needs. When you build your strength this way, theresults are always stylistically relevant and musical. Most trumpet practiceroutines cannot make this claim. Ironically, when you read the instructions, you will seethat the exercises in Trumpet Chops Pro should NOT be practiced musically.There should be no phrasing or style applied to most of the exercises becausethose things detract from the musical benefits of the book. These exercises shouldbe executed mechanically, almost robotically. That’s when your phrasing, style,and the other musical attributes of your trumpet playing will benefit most. Itseems unbelievable if you’ve never used Mr. Lewis’ books before, but you shouldsee real results after just a few weeks of using the Trumpet Chops series. Trumpet Chops Pro is for trumpet players who have a range upto C above the staff. 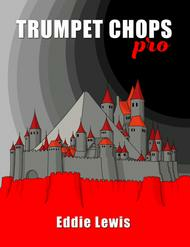 The complete Trumpet Chops series covers seven range andskill levels. Trumpet Chops Pioneer is for beginners with a range up to tuningC. Trumpet Chops Virtuoso is for expert trumpeters with a range up to the G anoctave above the staff. The series is used systematically to encourage strengththrough daily practice.